Will Smith, who will soon be seen alongside his 14-year-old actor-rapper son Jaden in M Night Shyamalan's post-acopalyptic action film After Earth, is currently promoting the film ahead of its June 7 release. 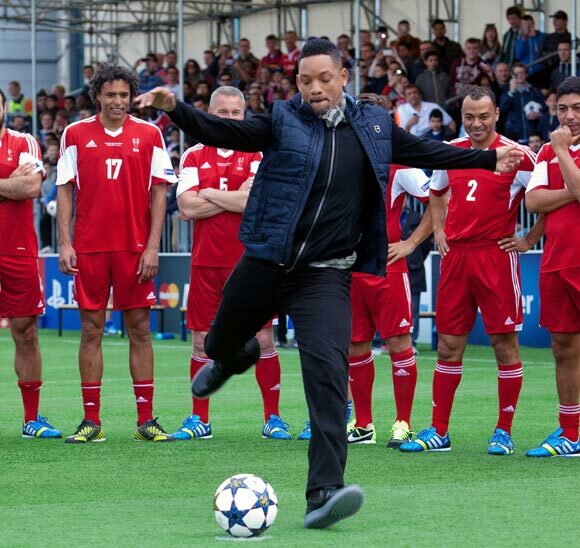 The Hollywood star recently attended the UEFA's Champions Festival at Queen Elizabeth Olympic Park in London, England. Jaden, who was last seen in 2010 action film The Karate Kid with Jackie Chan, braces himself for a session of football as players look on. In After Earth, the teenager plays Kitai Raige, who travels back to Earth with his father (Cypher Raige, played by Smith Sr) thousands of years after it was abandoned by humans. In comparison, Will Smith, looking dapper in his black get-up, appears to be much more confortable and in control on the field. The Hancock star has also produced and co-written the film. Besides being an actor, Jaden is also a budding rapper and has collaborated with Justin Bieber on his hit single Never Say Never. Will Smith entertains the gathered players with his antics on the ground.